1934 Chevy Three window Coupe Photo Picture Classic Cars for sale & Classifieds - Buy Sell Classic Car & Classic Truck Classifieds. Old Blue has been hiding in Montana for years and I thought you guys may enjoy looking at these photos. He is not for sale but it is encouraging to know that these cars are still out there. -Thank you Randy for sharing this picture with us! My brother had a twin to this car except it was Black w/brown mohair int. and it was pristine. We lived in a small logging town in WA state. In 1960 my father moved our family to Sacramento, CA and made my brother sell his car. I'm pretty sure it was sold for $150.00. A buddy of mine had a '35 Chev with early '60s corvette drive train and 'glass fenders. Licensed and legal, he sold it for $1500. He still kicks himself for that, and when he don't, I do. That thing was a p--- magnet! Bet this old gal spent lots of time under cover.The old pre 36 GMs with the wood cage tend to fall apart out side after the top gives in.Lot of class in this one.Chevy was way ahead of Ford with the wing glass.34 Ford cars did have the extra lip on the rear of the glass metal that let the glass go back a few inches and make a vent.The chevy type let you adjust lots more.1933 is my fav in the 30s chevy coups.Like the three slant hood sides doors better.My 32 had hood side doors but 33 just look more art like to me.34 they went to the hood side slats like this one.By 1937 all wood was gone I think.My 37 truck has no wood behind the dash but the 36 one and 1/2 I got the WS crank out of had it.The dash and doors were the same. like to know where in Montana. I wouldn't change a thing, except putting in a sbc, etc. Rod on! 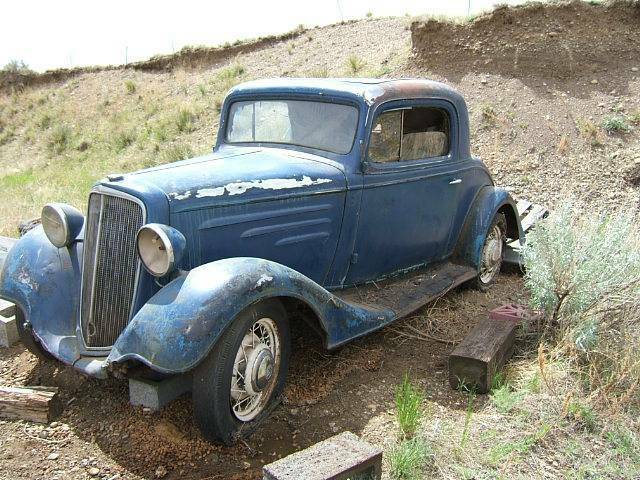 I've been in search of a '33-'35 Chevy coupe for years. This is the best one I've seen! This is a great keeper and will most likely sit right where it is until hell freezes overs.Bugsy backed this little chevy up, switched the loot, and made a clean get away. If he hadn't, she wouldn't still be there. Great find buddy!